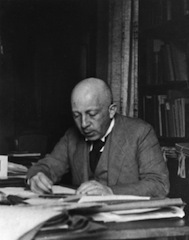 Born in Berlin in 1880, Professor Paul Jacobsthal was an eminent German archaeologist and art historian at the University of Marburg where he maintained an international reputation for his leading expertise as a Classical archaeologist. An innovator in his field, he began to explore the connections between Greek and Celtic art as early as 1921. He was forced into exile by the Nazi regime in 1935 in the wake of the Race Laws. He found refuge in Oxford but was interned for a period on the Isle of Man in 1940, under suspicion as a potential ‘enemy alien’. After the War he refused to return to Marburg alleging that there was still a Nazi in the faculty. Instead, he remained in Oxford and sought to rebuild contacts, communication, and exchange of archaeological research with his former colleagues in Germany, many of whom helped him with much risk throughout the war period. Much of his work was political in its outright rejection of Nazi ideology, which was being forced upon German academia at this time. His research, ideas and specialism into Celtic art in Europe ran counter to the Nazi notions of Teutonic heritage . The Institue of Archaeology holds the largest collection of his personal correspondence, research notes, drawings, and photographs, giving us a detailed insight into the workings of this great archaeologist in fascinating but volatile times.